There are endless of options for the elite group of fliers who prefer to travel via private aircraft. For luxury travelers, corporate jet-setters and even pilots themselves, the Cirrus SR22 holds a special place in the aviation industry. This iconic aircraft will take you on an exhilirating ride up, up and beyond. Built to host a maximum of five passengers, the single-engine aircraft is perfect for shuttling small groups cross-country whether you’re traveling for business or pleasure. 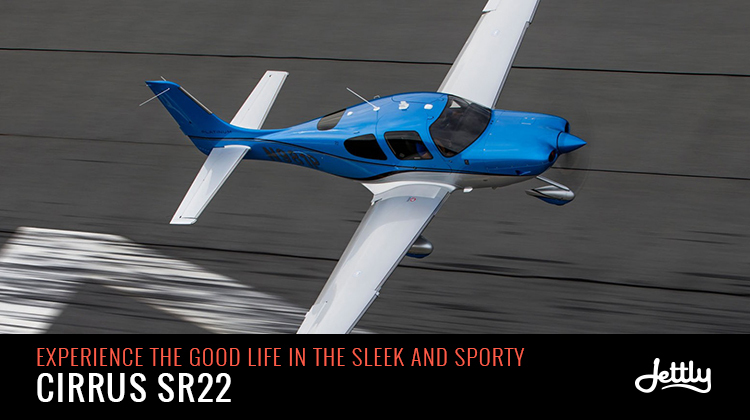 The Cirrus SR22 was designed to provide frequent fliers the lifestyle they dream about. With this private plane, you can jet off anywhere in the world at a moment’s notice. From its ultra-comfortable cabin to its sleek body that exudes unprecedented style, the small liner is truly your ultimate travel partner. Manufactured by Continental, a company known for its revolutionary designs that always place a premium on beauty, performance and safety, it truly has history on its side. After all, it’s been 14 years of the Cirrus SR22 and it continues to dazzle as the best-selling aircraft in its class. Truth be told, the sleek and sporty jet is on a class of its own with some even referring to it as “the perfect plane.” What makes this aircraft so irresistible? That’s quite the considerable list. Of course, one of the most important factors in determining the quality of an aircraft is the comfort it’s able to provide the people aboard. Flying on the Cirrus SR22 is a delightful experience as it’s created for total comfort even thousands of feet up in the air. A stark contrast from commercial airplanes where passengers have to squeeze into their seats, the enormous cabin is a definite treat with ample leg room for a five-person party. Specifically, the roomy cabin has a comfortable width of 49 inches and height of 50 inches. Another great feature of the plane is 60/40 FlexSeating™. During long flights, travelers can easily recline their luxurious leather seats and lounge or sleep comfortably on their makeshift beds. If you need extra cargo space during a trip, you can fold the seats and use the room for large luggage or sports equipment like skis. These creature comforts and additional safety features like the child-safety restraints create a cabin that will almost make you forget you’re flying. Large tinted windows allow passengers to enjoy the spectacular views in its glory while keeping the space just bright enough to be pleasant. The spacious aircraft is a great advantage when you’re flying for work as the Cirrus SR22 is surely befitting for company VIPs and potential partners. The Cirrus SR22 continues to wow with its incredible performance that’s at par with the industry’s best. With its premium Continental IO-550-N 310 HP Engine, the aircraft is able to achieve both considerable power and speed, while helping the passengers feel the smoothest ride they have ever experienced as they glide through the clouds. Pilots will fall in love with the Cirrus Perspective+™ by Garmin® Cockpit as it not only looks fantastic but offers an intuitive flying experience that is easier than ever. The innovative Synthetic Vision Technology (SVT™) offers the most useful and safety-enhancing screen that’s more in-depth than ever. Experience what it feels like to fly on the Cirrus SR22 or other similar private aircrafts. Jettly has a selection of nearly 10,000 aircrafts around the world ready to fly you to your destination with a click of a button. Best of all, there are no extra fees, no hidden charges and no commission rates, so private air travel is more affordable than ever. Submit a flight request with Jettly today!